Photos are following the announcement .. through my antique filigree shop, I have at heart to offer you a gallery of old and authentic objects and objects (no copy, fake or reissue) at really affordable prices I take special care of my descriptions: you bid for what you see. Very nice little painting (nineteenth century) made in oil on wooden panel (cigar box lid "los dos carbatales") representing a river with boat and fisherman under a tree, in the distance are outlined the contours of a village. Very nice bill for this work that will require some attention, including a cleaning of the pictorial layer (the varnish is dirty). The frame is offered with (a few sets of angles - visible on photos). Dimension with frame: 31,5 / 38,5 cm, panel: 12,5 / 19 cm. The shipping price includes the cost of transportation as well as the cost of supplies necessary for the protection of the work. The subscription of a delivery insurance. Remains the only remedy available in case of loss, theft or damage during the expedition. It remains your choice and your responsibility. For a purchase from abroad. Thanking you in advance for your trust. 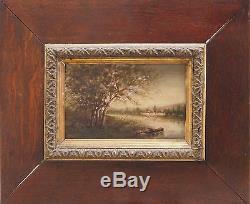 The item "painting nineteenth century boat with fisherman river edge + tree frame" is on sale since Saturday, February 18, 2017. It is in the category "art, antiques \ art of the nineteenth and before \ paintings, enamels".